Should you be exercising when you are feeling sick? A couple of weeks ago I started to feel ill. I had a cough and stuffy nose. I caught a cold. This put a damper on my training. I took a couple days off from my workouts and on the third day I tried to exercise but with little success. I felt short of breath. The next day a full blown fever hit me and I couldn’t train at all that day. Not long after that I received an email from Tribesports.com to contribute to their website and they asked me to write a post on training for sport while sick. Interesting coincidence. So should you exercise when you are sick? Generally speaking if your symptoms are above your neck then moderate training/activity is acceptable during the course of the cold. http://europepmc.org/abstract/MED/9813869. If you have a runny nose and sore throat without a fever or general body aches and pains then intensive exercise training may be safely resumed a few days after the resolution of symptoms. 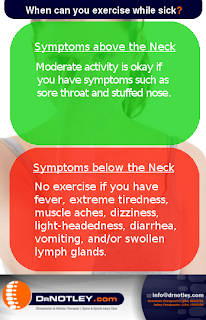 If symptoms are below the neck then don’t train and get to bed! If you have a flu symptoms, fever, extreme tiredness, muscle aches, dizziness, light-headedness, diarrhea, vomiting, and/or swollen lymph glands, then don’t exercise. Once the symptoms are gone take 2 to 4 weeks to build up to your previous intense training. If you are using a decongestant an increase in heart rate will result in addition to the increase from the workout. This may lead to shortness of breath and difficulty breathing. This is why I stopped working out during one of my workouts during my cold. For those with asthma exercise with cold may worsen your asthma symptoms. Diabetics may also have problems when they are sick. Being sick results in an increase in blood sugar at rest as well as a decrease in blood sugar during activity. Monitoring your blood sugar more closely is recommended for diabetics who are sick. Listen to your body before you decide to train. This entry was posted in Ask the Chiropractor, Uncategorized by DrNotley. Bookmark the permalink.